For the TV series, see Big History (TV series). Big History is an emerging academic discipline which examines history from the Big Bang to the present. It examines long time frames using a multidisciplinary approach based on combining numerous disciplines from science and the humanities, and explores human existence in the context of this bigger picture. It integrates studies of the cosmos, Earth, life, and humanity using empirical evidence to explore cause-and-effect relations, and is taught at universities and secondary schools often using web-based interactive presentations. It is an academic movement spearheaded by historian David Christian of Australia's Macquarie University, who coined the term "Big History", and is made of an "unusual coalition of scholars". An early example of teaching big history is found in John F. Kennedy's famous speech at Rice University where he explains 50,000 years of human history condensed into half a century. Some historians have expressed skepticism towards "scientific history" and argue that the claims of Big History are unoriginal. Big History makes comparisons based on different time scales, or what David Christian calls "the play of scales", and notes similarities and differences between the human, geological, and cosmological scales. Christian believes such "radical shifts in perspective" will yield "new insights into familiar historical problems, from the nature/nurture debate to environmental history to the fundamental nature of change itself." It shows how human existence has been changed by both human-made and natural factors: for example, according to natural processes which happened more than four billion years ago, iron emerged from the remains of an exploding star and, as a result, humans could use this hard metal to forge weapons for hunting and war. The discipline address such questions as "How did we get here?," "How do we decide what to believe?," "How did Earth form?," and "What is life?" It offers a "grand tour of all the major scientific paradigms." According to one view, it helps students to become scientifically literate quickly. 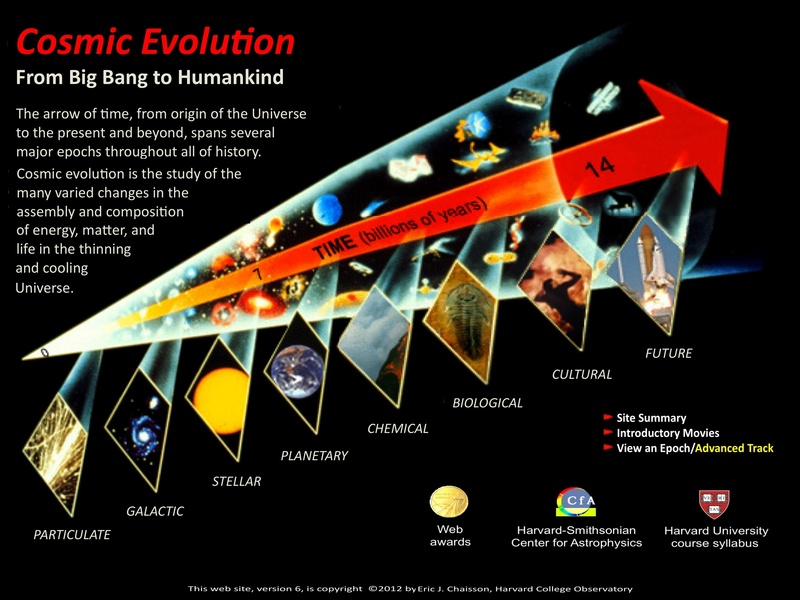 One popular collection of scholarly materials on cosmic evolution is based on teaching and research that has been underway at Harvard University since the mid-1970s This AoT graphic is a high-resolution image of the opening page of a huge multi-media website on "Cosmic Evolution: From Big Bang to Humankind", which contains text, images, animations, movies, and hyperlinked references of interest to both non-scientists (Introductory Track) and professional scientists (Advanced Track). Other notable efforts include a large website on "Voyages Through Time", produced by the SETI Institute. Cosmic evolution is a quantitative subject, whereas big history typically is not; this is because cosmic evolution is practiced mostly by natural scientists, while big history by social scholars. These two subjects, closely allied and overlapping, benefit from each other; cosmic evolutionists tend to treat universal history linearly, thus humankind enters their story only at the most very recent times, whereas big historians tend to stress humanity and its many cultural achievements, granting human beings a larger part of their story. One can compare and contrast these different emphases by watching two short movies portraying the Big-Bang-to-humankind narrative, one "Arrow of Time" animating time linearly, and the other "Cosmic Origins" capturing time (actually look-back time) logarithmically; in the former, humans enter this 14-minute movie in the last second, while in the latter we appear much earlier—yet both are correct. One estimate suggested that the population density of the ancient city of Rome was eight times that of modern-day New York City. When Columbus supposedly "discovered" the Americas, the two continents were already inhabited by ninety million people, which was a third of the world's population. The ancient city of Rome was "eight times" more densely populated than the present-day city of New York. About 100,000 years ago, there were "barely enough people on Earth to fill a football stadium." Humans are 50% heavier and four inches taller in the past 100 years than they have been throughout most of human history. Big Historians suggest that modern currency may have had its origins in primitive bead making, which happened about 43,000 years ago in the Mediterranean region. Another robust multi-media web site, developed over decades and including many video/animation interactive features related to Big History, can be found at "Cosmic Evolution: From Big Bang to Humankind", which includes parallel tracks of interest to both introductory learners and technical experts. While the emerging field of Big History in its present state is generally seen as having emerged in the past two decades beginning around 1990, there have been numerous precedents going back almost 150 years. In the mid-19th century, Alexander von Humboldt's book Kosmos, and Robert Chambers' 1844 book Vestiges of the Natural History of Creation were seen as early precursors to the field. In a sense, Darwin's theory of evolution was, in itself, an attempt to explain a biological phenomenon by examining longer term cause-and-effect processes. In the first half of the 20th century, secular biologist Julian Huxley originated the term "evolutionary humanism", while around the same time the French Jesuit paleontologist Pierre Teilhard de Chardin examined links between cosmic evolution and a tendency towards complexification (including human consciousness), while envisaging compatibility between cosmology, evolution, and theology. In the mid and later 20th century, The Ascent of Man by Jacob Bronowski examined history from a multidisciplinary perspective. Later, Eric Chaisson explored the subject of cosmic evolution quantitatively in terms of energy rate density, and the astronomer Carl Sagan wrote Cosmos. Thomas Berry, a cultural historian, and the academic Brian Swimme explored meaning behind myths and encouraged academics to explore themes beyond organized religion. The famous Earthrise photo may have stimulated an interest in interdisciplinary studies, according to one view. Perhaps a major turning point resulted from efforts by a scholar of Russian history named David Christian of Macquarie University in Sydney, Australia. He read widely in diverse fields in science, and believed that much was missing from the general study of history. His first university-level course was offered in 1989. He developed a college course beginning with the Big Bang to the present in which he collaborated with numerous colleagues from diverse fields in science and the humanities and the social sciences. This course eventually became a Teaching Company course entitled Big History: The Big Bang, Life on Earth, and the Rise of Humanity, with 24 hours of lectures, which appeared in 2008. Barry Rodrigue, at the University of Southern Maine, established the first general education course and the first online version, which has drawn students from around the world. The University of Queensland in Australia offers an undergraduate course entitled Global History, required for all history majors, and "surveys how powerful forces and factors at work on large time-scales have shaped human history". By 2011, 50 professors around the world have offered courses. In 2012, one report suggested that Big History was being practiced as a "coherent form of research and teaching" by hundreds of academics from different disciplines. Note: Sometimes the terms "Deep History" and "Big History" are interchangeable, but sometimes "Deep History" simply refers to history going back several hundred thousand years or more without the other senses of being a movement within history itself. This page was last modified on 23 April 2016, at 13:35.